Former U.S. National Security Agency contractor Edward Snowden appears live via video during a student organized world affairs conference at the Upper Canada College private high school in Toronto, Feb. 2, 2015. All questions about the plans the former employee of U.S. secret services, Edward Snowden, may have has should be addressed to his lawyers, Russian presidential spokesman Dmitry Peskov said, when asked if there has been any news regarding the further likely march of events after the United States eased punishment for WikiLeaks informer Bradly Manning. "This is not a question for the Kremlin to answer. We have no information about what Mr. Snowden is doing," Peskov said. He recalled that Snowden, a former employee of the National Security Agency, was in Russia under a temporary permit which had been prolonged. "We have no further information. All of his contacts with the outside world are through lawyers, including his lawyer in the United States. That’s their question," Peskov said. Edward Snowden, a former employee of U.S. secret services, shared with the mass media documents regarding electronic spying programs of the U.S. National Security Agency. In June 2013 he left the United States for Hong Kong. From there he took a flight to Moscow, his final destination being Ecuador. Eventually he had to remain in Russian territory after the United States annulled his passport. 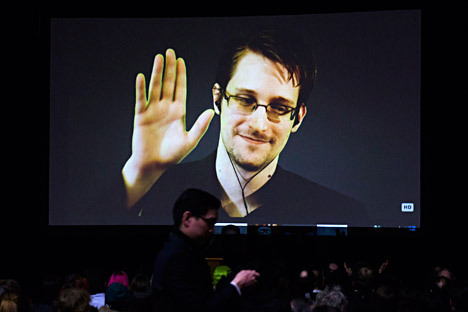 In 2014 Snowden obtained a three-year residence permit.